You know you’re a knitter when you pack your knitting projects before your clothes. This cannot be truer! When I packed for my 5-days trip to Aix-en-Provence to teach at Le Chat qui Tricote, I first packed my knitting projects, then my class material and finally my clothes and other stuff. All-in-one, I had enough yarn and WIPs to knit (and hand-stitch, and read…) for at least 2 months! I’ve been wanted to start a new shawl for a while now and decided a stash diving was in order. The plan was to find two or three colours which play well together and start a fair-isle / lace / short-rows shawl. 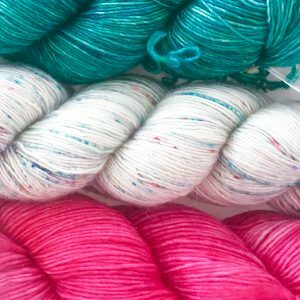 From top to bottom: La Fée Fil Mérinos Single in Alga Marina and Mine de Crayon; Dream in Color Jilly in Hot Pants. 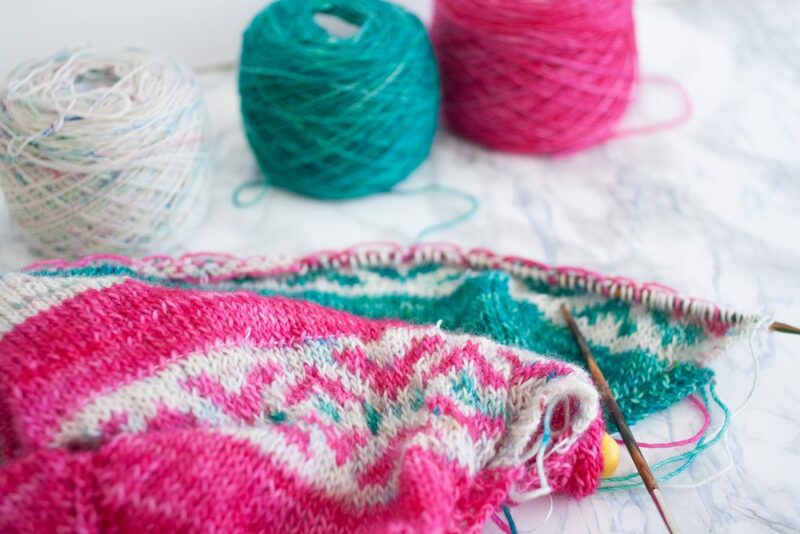 Fair-isle needs a good amount of contrast between yarns. At least, if you want the pattern to be the star of the show. These three were meant to be together, don’t you think? After a quick sketch, I started without doing any maths or pre-planning stitches as it was basic a stocking stitch triangle. 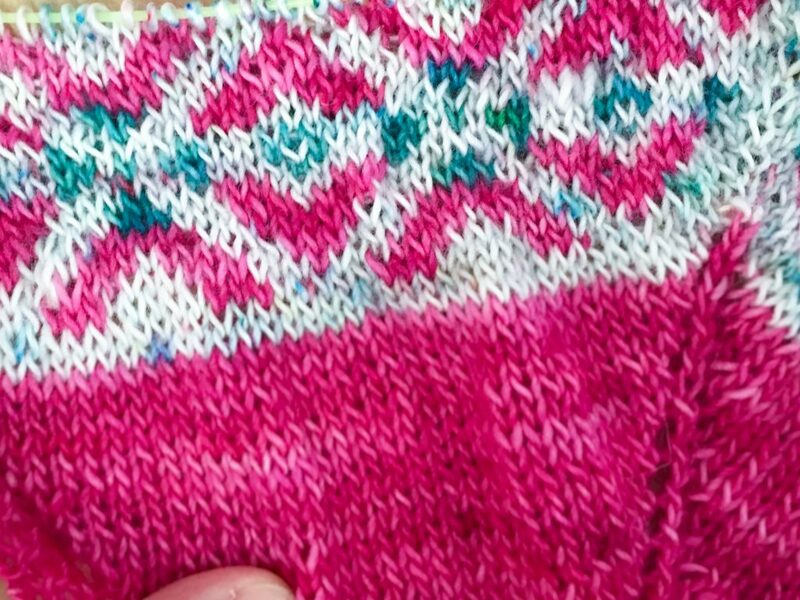 The fair-isle stitch pattern twisted my mind at some point, first because I messed up the increase rate in my drawing, then because I was determined to use all three colours in the same pattern even if I knew deep down in my heart that it was not such a good idea. I can be stubborn as a mule sometimes which ended me up drawing it with three colours rows, knitting it, frogging it, re-drawing it with only two colours in each row, re-knitting it. I’m so much more happy with now! Coming next is plain boring large stripes of colours and an even larger fair-isle section. I’d better get starting a good movie and get knitting it! I can already picture it, can you?